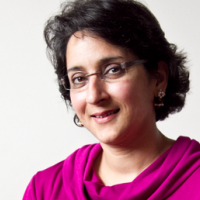 Meena Khandelwal is best known for her research on Hindu religious renunciation. This work resulted in an ethnography entitled Women in Ochre Robes (SUNY Press 2004) that focuses on the everyday lives of women initiated into sannyasa, a particularly extreme variety of Hindu asceticism. Sannyasa entails the renunciation of marriage, family ties, wealth, caste, and professional status for a life of celibacy and spiritual discipline. This book explores the complex gendering of a tradition that, on the one hand, was created by and for elite men, and, on the other, claims to transcend gender. Although, historically, women have been excluded from sannyasa, female renunciants (sannyasinis) comprise a substantial minority of contemporary initiates. Khandelwal’s research suggests that sexuality and celibacy are mutually implicated and that abstinence should be accounted for in the field of sexuality studies. She co-edited a volume with Sondra Hausner and Ann Grodzins Gold entitled Women’s Renunciation in South Asia (Palgrave Macmillan 2006). A South-Asian edition of this book was published with the title Nuns, Yoginis, Saints and Singers (Zubaan 2007). Khandelwal has also published on the transnational aspects of Hindu renunciation, including an essay on foreign swamis who have migrated to India (Identities 2007). Her essay “The Cosmopolitan Guru: Spiritual Tourism and Ashrams in Rishikesh” examines renunciant cosmopolitanism in the yoga capital of the world (in The Guru in South Asia ed. by Copeman and Ikegama, 2012). Meena Khandelwal and Kayley Lain reflect on half a century of failed efforts to change how people cook in rural India, before adding a little device of their own to the fire.